Northern Pike are the fresh water sharks of the north and are feared by all other fish because they eat anything. 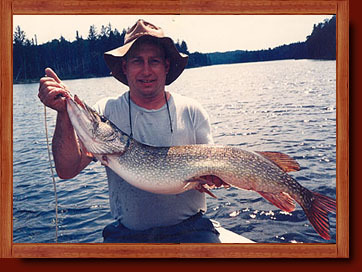 Northern Pike are very common in the central and south-arm of our lake and they hit just about any lure. The central and south-arm of Ivanhoe Lake, which is shallower and has more weeds, is just what Northern Pike like and it's the perfect conditions to grow big trophy pike. These pike patrol the shorelines and wait near the mouths of creeks, rocky points or thick weed-beds to ambush Walleyes and Perch, which are all abundant in our lake. 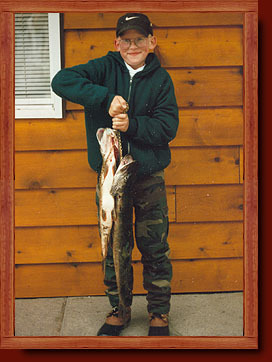 Northern Pike are very common in the 2 to 6 pound range, which are the best eating sizes. Many of our guests catch and release bigger trophy pike over 40 inches and on occasion, guests catch pike that are much bigger. 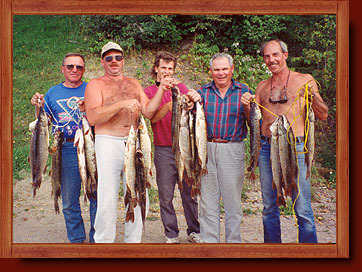 Ivanhoe Lake has a really high population of Whitefish. During the summer these Whitefish stay in the deeper north end. Some of the bigger monster size Northern Pike can be found up in the north end and out in open water feeding on schools of whitefish. 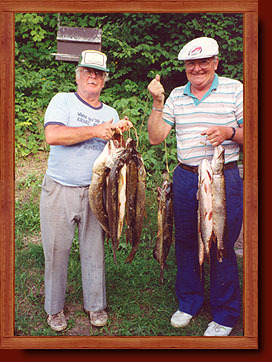 It does not matter where you go on Ivanhoe Lake, you will catch pike. Size Restrictions Sport License: Only 2 greater than 24 inches. Only one greater than 34 inches. Size Restrictions Conservation License: Only 1 greater than 24 inches. Zero greater than 34 inches.